Let’s get one thing straight: you’re (probably) never going to drive a Bugatti Chiron. At least not in real life. Now, however, you can pilot one in the Forza Motorsport 7 video game. The French multi-million-dollar road missile is part of a new downloadable pack of cars that’s just made its way into your virtual world. It’s not the only vehicle jumping to your console though, as this pack is… er, packed with a few other fairly interesting machines. 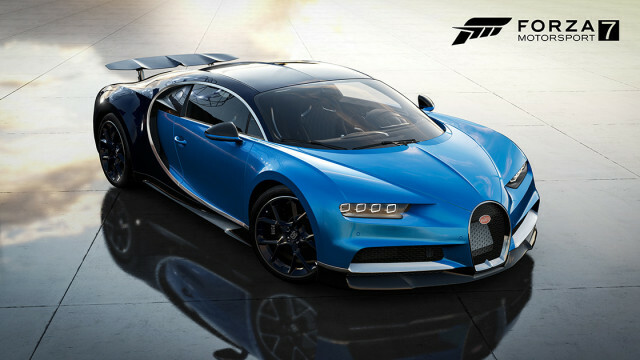 In addition to the the Bugatti, Forza and Turn 10 have added six other cars and trucks. Fans of muscular trucks have a pair of mighty Mopars from which they can choose. In one corner sits the pumped up Ram Power Wagon. For more street-focused SUV speed, there’s the Dodge Durango SRT. Kia is jumping into the Forza world now as well. The Stinger GT has arrived to take on all manner of racing circuits the game has to offer, be they real or fictional. For fans of Aussie muscle, Forza has included a classic bit of Oz cool. While it looks like the Chevy Nova we all know and love here in the States, it’s actually a 1968 Holden Monaro GTS 327. This is a first-generation car, which debuted in 1968 and the GTS 327 model was the top spec at the time. Finally, if you actually want to drive focused racing machines in your racing game, then Forza has a pair of cars that will interest you a bit more. The Aston Martin V-12 Vantage GT3 and Rotek Racing Audi TT-RS are now both available via this expansion pack. That Aston Martin is notable for simply being an awesome race-ready V-12-powered British beauty. The Rotek Audi, on the other hand, is an excellent addition as it’s been used to win at Thunderhill, the Nürburgring, and even Pikes Peak. Driver Robb Holland has pushed his Audi to many a first-place finish and now it’s wonderful to see his race car included in the Forza world. If you have the Car Pass, then your download is waiting for you on your Xbox. Otherwise, you’ll need to fork over $6.99 for this latest vehicular addition.